Further upstream from Ram Jhula is the point where Lord Rama's brother Laxman is believed to have crossed the Ganges on a jute rope. Today, Laxman Jhula, another suspension bridge very similar to Ram Jhula, affords an easier crossing. Laxman Jhula is a 450 feet long suspension bridge and was built in 1939 by british. This bridge worked as a source of inspiration for the design of newly build Ram Jhula by indian architects and designers. If Ram Jhula is associated with the earnest worship with its cluster of ashrams. 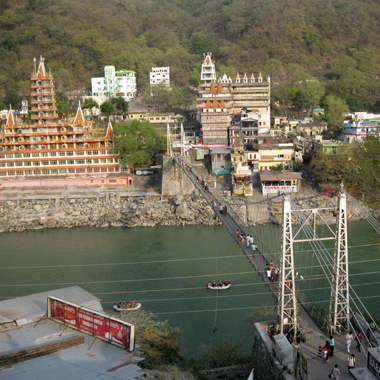 Laxman Jhula is the centre for good times with its bazaars and crowded cafes. The view from the cafes overlooking the jhula - temples, bathing ghats, prayer flags and strips of clean, sandy beaches lining the river - is inspiring. A very moving experience is to stand in the centre of Laxman Jhula and feel the freshness of air, sound of flowing water rushing through the Ganges, the scenic beauty of the region and the sounds of the bell chimes create an unforgettable experience. Rafts full of adventurers passing under the bridge adds to the scenic beauty of the place.